Finding the right school or nursery for your child is one of the biggest concerns for parents in our area. Recommendations from Local Mums are a great place to start. "I highly recommend 'Fun on Fridays' at�Bertrum House School�to Local Mums. 'Fun�on Fridays' is�Tilly’s�highlight of the week. 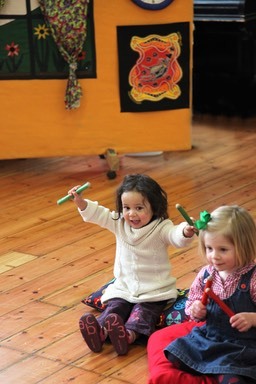 �Sarah from Monkey Music is absolutely great; then it’s off to paint, play with water and lots more!" "I�recommend�'Fun on Fridays' at�Bertrum House School�to all Local Mums. 'Fun on Fridays' is fantastic! �Anya loves the music and dancing. �The painting and play afterwards is great." Bertrum House is a non-selective family school where you will find a strong community spirit among the children, parents and staff. Established in 1984, the school specialises in the five formative years of education from 2 to 7 years old. 'Fun on Friday' sessions are held at the school's Rowfant Road site. Sessions are limited to 12 children so please call the school office early to book a place.